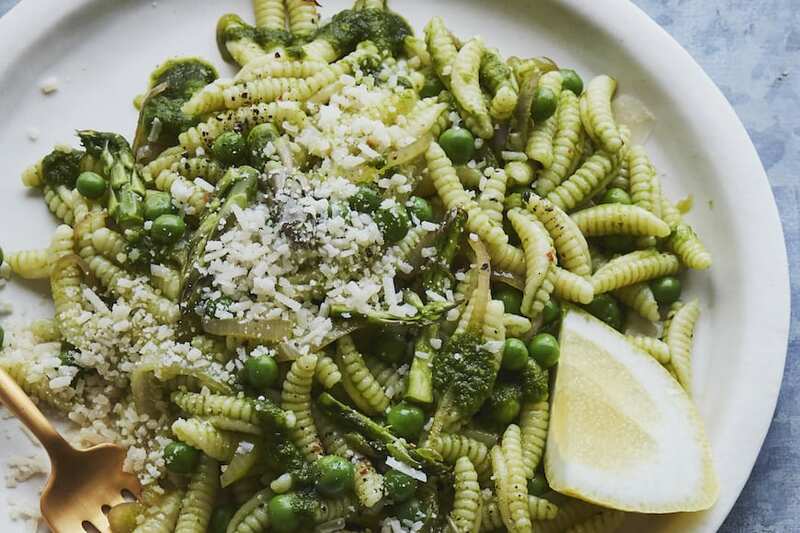 Some people might think it’s strange to fry pasta. I think it’s totally normal. And I fully encourage such behavior, because without it, we’d never be able to enjoy Fried Ravioli. There are a few simple things in life that give me great great joy. Getting an extra 5 minute massage while getting a manicure, freshly washed sheets, having someone else clean up the kitchen after I make a giant mess, watching the Hunger Games or Harry Potter over and over and over again, and Fried Ravioli. It’s the little things in life that really make the world a better place and I think this Fried Ravioli does just that. Quite simply, it’s whatever kind of ravioli you like, breaded and fried. Simple. Easy. Maybe you’re 5 cheese kind of person, or wild mushroom kinda gal or perhaps a butternut squash guy or maybe you’re the spinach and cheese type. Come to think of it, there should probably be a chicken parmesan stuffed ravioli. I’d like to be that kind of person. Whatever kind of ravioli person you are, the technique is the same and it will yield delicious snacks that will make you and all your loved ones happy. This I can promise! 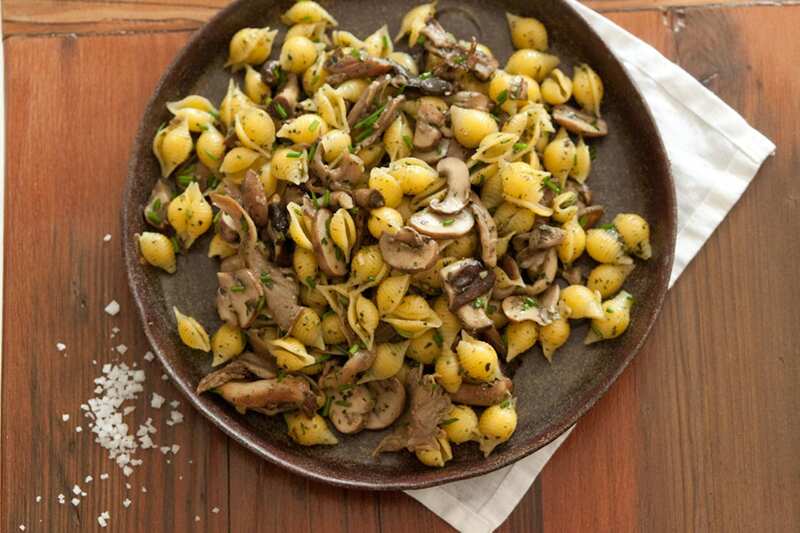 Serve it alongside of your favorite kind of tomato sauce and appetizers are ready. Or turn it into a Fried Ravioli tasting party and serve up a handful of assorted fillings and pour everyone a glass of vino, turn on some tunes and dance the night away. Pour the oil into a large heavy bottom pan and heat over medium heat. While the oil is heating, whisk the eggs milk and put into a bowl. Put the breadcrumb parsley in a separate bowls. Dunk the ravioli in the liquid mixture and then in the bread crumbs. Place the ravioli on a plate, and continue with the remaining ravioli. When the oil is hot, fry the ravioli in batches, turning occasionally, until golden brown, about 60-90 seconds on each side. Once golden brown, using a slotted spoon or pair of tongs, carefully transfer the fried ravioli to paper towel lined plate to drain. 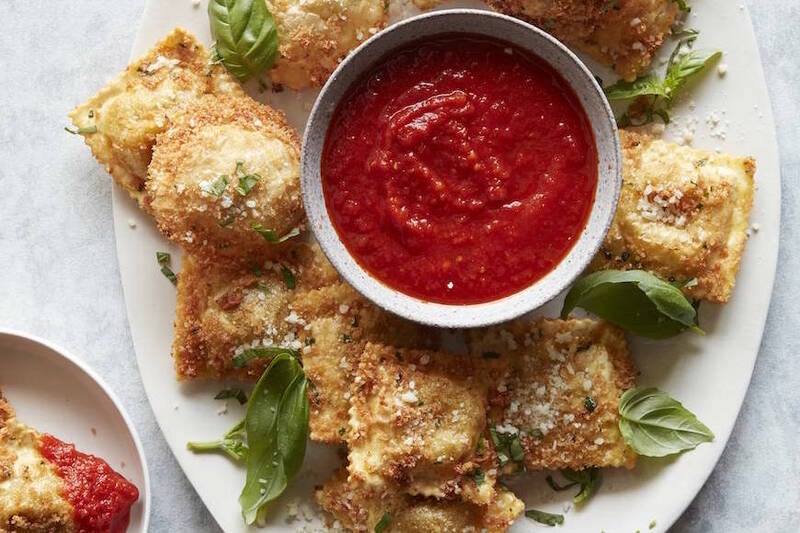 Grate fresh Parmesan on top of the fried ravioli, season with salt and pepper and serve with a bowl of warmed marinara sauce for dipping and herbs on top to garnish. Gaby, I love fried ravioli’s. I’m going to give the milk and bread crumb version a try. Sometimes, I just brush them with olive oil and bake them! Thanks! I feel like these are a big St. Louis thing, right? My friend from there is always raving about fried ravioli. Love the video- you’re right, what a perfect easy appetizer. And whoever invents chicken parm raviolis first wins a Nobel prize. totally encourage frying of pastas as well! this is so easy and something i could make for a party! Yum times one million! Fried ravioli are one of my favorite apps, too. These look perfect, Gaby! Gaby, love the video! I’m inspired to try these too! I LOVE fried raviolis. I’m the mushroom type, but lets get really–I’d take any fried ravioli before me. Thanks for the milk tip–gonna give that try. Fried Ravioli is a big St. Louis thing; there is a large Italian community call ‘The Hill’ with several restaurants featuring this dish; all claiming theirs to be the best. I haven’t been back home in a long while but each trip requires a visit to The Hill…now why I’ve never done these at home is beyond me. That needs to change! OMG. 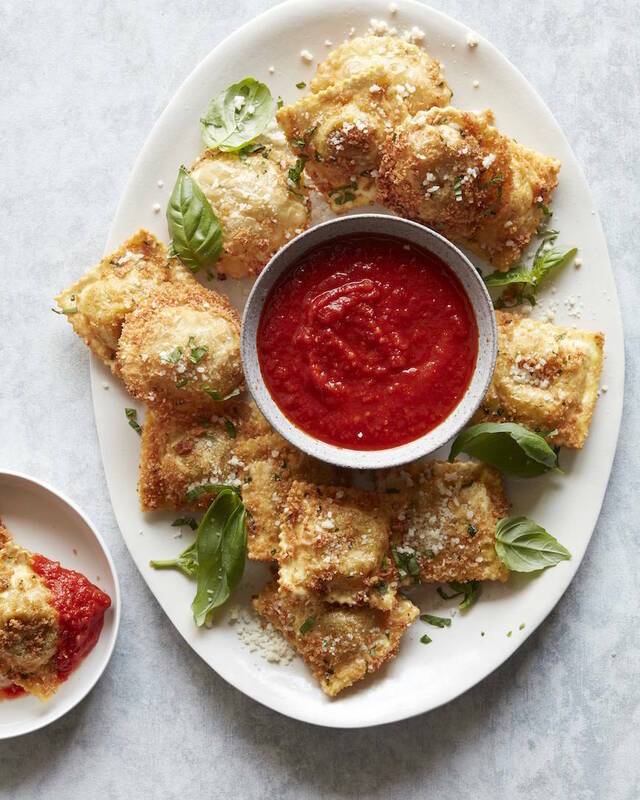 I have never had fried ravioli, but there is no question I could REALLY get into these!! I don’t think it’s weird at all to fry pasta. Fried ravioli is a St. Louis tradition and one of my favorites at a local restaurant. Love this Gaby! I need to try this! Great idea! Love ravioli like this! You can also bake them (just be sure to brush them with a multitude of butter while cooking). The perfect appie! I must try these! My mother would sometimes reheat pierogi by frying them, but not with a crispy coating. These look fantastic! I have never tried fried ravioli but that will be remedied very soon!! Also have never tried coating with milk, so will give that a whirl as well! I don’t even like fried food but I dig your version of these! Love this cozy, easy comfort food! Perfect for weeknights. Great video, Gaby! I’ve never had fried ravioli and those crispy little squares are definitely calling my name. Pinning to try soon! Whoa!! I could go for a bowl of these, Gaby! Help me. These are genius apps. I’d eat a bowlful in a second. And love the images too! Oh my ~ I’ve never had anything like this. Now I must asap! Clearly my life has been missing something – and THESE are what it’s been missing!! Dang girl1! These look amazing! Always a favorite! Wondering…do the ravioli need to be frozen or thawed? The video doesn’t specify. Ooooh, love it, Gaby! Great appetizer! Love these so much! Just shared on my facebook page too! Cute nails and extra yummy ravioli! You might have just convinced me to eat ravioli. What kind of “heavy bottom pan” did you use? Will any pan work? 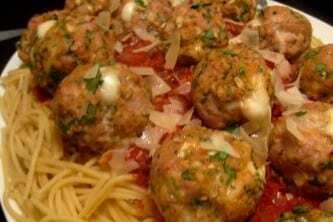 Hey Gabi, I wanted to make this for my dear son’s bday party, wanted to know if I can make it today & serve it tomorrow. Wanted some tips on that. thanks in advance. for kids it would probably feed about 4-5 as a snack!! you just need a heavy bottom skillet or pan!! I just watched you do these on SnapChat, and am so excited to make them tomorrow!!!! Love your Snapisodes! I could pop those in by the dozen- yum! The perfect party food!!! Love this! make them – dont cook them – then bread them and fry them!! So I’m digging way back in the archives but….Question: If I’m taking to a party (down the street) and plan to make ahead, suggestions for keeping them warm?? or would it be best to reheat in an over there? Would these work in an air fryer?